Super Bowl 2014. The Seattle Seahawks destroyed Peyton Manning and the Denver Broncos in the franchise’s first-ever victory at the NFL’s pinnacle event. As QB Russell Wilson – aka my husband, Colin’s, man crush – raised the Vince Lombardi trophy in triumph, those few handful of Seahawks fans who had cheered for the team throughout its long history of total suckage experienced long-awaited redemption. Colin declared he could die a happy man. Later that month, we celebrated our 10-year anniversary. Talk about anticlimactic. Super Bowl 2015. The Seahawks had overcome many obstacles to make it back, and were battling it out with the Boston Patriots in an evenly matched, fairly called game. Down four points, with under a minute left in the fourth quarter, the Hawks were at the Patriots’ 1-yard line and within arm’s reach of a repeat. Then the unthinkable happened. Instead of giving the ball to Marshawn Lynch to punch it in the end zone, like anyone who knows a lick about football would choose to do, the Seattle coaches called a risky pass that was intercepted, securing the win for the Patriots. Once the initial shock wore off, Colin wept bitterly, on the inside. I didn’t know what to say or do to comfort him, so I simply whispered, “Sorry hon,” patted him on the back, and left him alone to work through his grief. Track with me here in this terrible transition from talking about how to console loved ones dealing with sports-induced depression to talking about how to encourage loved ones coping with infertility. Watching a friend or family member undergo the physical, emotional, and financial hardships caused by infertility can make you feel helpless. If you’re already a mother, you long for your loved one to share the exasperating yet joy-filled experience of having children. But how can you support her, knowing there’s a heckuva lot you shouldn’t say, and besides taking it to the Lord in prayer, there’s nothing you can do to help fulfill her desire to become a mom? While you can’t erase your friend’s pain, you can seek to understand specific ways to express your care and concern. Realize, though, that even if you say the “right things” and treat her with utmost sensitivity, she might still be sad and discouraged and downright ornery. She’ll also be grateful for your love and companionship as she traverses her difficult path to parenthood. Colin urged me to use a photo of hugging cats for this post, so here’s what I found. Unfortunately, I didn’t come across any great pics of hugging cats wearing Seahawks jerseys. Words often fall short when someone is grieving, but a shoulder to cry on is almost always welcome. When your friend receives news of yet another negative pregnancy test, or an adoption opportunity falls through, tell her you’re sorry, you love her, and that you’ll be there for her if/when she wants to talk about it. If your friend says she’s open to sharing her infertility issues with you, go ahead and ask her a broad, open-ended question such as “What options are you considering?” Whether she’s pursuing fertility treatments or adoption or taking a break from it all, demonstrate your concern about what she’s experiencing and feeling. When you know she has a doctor’s appointment or a meeting with a social worker coming up, send her a text or email ahead of time and let her know you’re thinking about her. Allow her to decide when/if to tell you how it went. Mother’s Day is pure hell for a woman having trouble having kids. As well, the vast number of holidays that revolve around giving gifts to children or acknowledging children as gifts can add to the ache. Even birthdays can be painful reminders of that damn ticking clock. Recognize that your friend may be hurting during these celebrations and do something to make her feel special – write her a note, bring her lunch, or take her out for a mani/pedi date. Remember the days when you were so pissed at your parents that you ran to your room, slammed the door shut, and shouted with all the self-righteousness of a 15-year-old, “You just don’t understand me!”? A woman who is struggling with infertility feels like no one gets what she’s going through – lonely, isolated, an outcast from our baby bump-obsessed culture. Your friend can combat these lies and experience healing through community by attending a support group for those facing childbearing challenges. This is, of course, a shameless plug for the ministry I’m facilitating, Graceful Wait, but there are plenty of other great resources out there for finding support groups, either online or otherwise (see list at the end of this post). Ain’t no baby ever came into this world who didn’t have the Lord Almighty breathe life into his or her tiny little body. Commit yourself to pray for your friend, even if she’s given up on it. Pray that she will receive the child she so longs for, that she will have wisdom to know how to walk toward that end result, and that she will grow in faith and dependence on Christ throughout the whole process. The day we left town to pick up my oldest son, Calvin, from the hospital – less than 24 hours after we got the call from our social worker that we were going to be his parents – we had nothing at our house to prepare for an infant but an empty room and a couple of cute frog paintings I’d bought at a yard sale for my “someday” baby’s room. We returned a day and a half later to find that empty room converted to a fully fledged, well-stocked nursery, complete with crib, changing table, bouncy seat, diapers and dozens of other essentials, toys, wall décor, and a neat little row of onesies hanging in the closet. Our church small group had come over while we were gone and pulled a surprise home makeover. The friends who had walked with us through months of terrible disappointment, including an epic fail of an IVF cycle, had jumped at the opportunity to minister to us in our time of celebration. To this day, it is one of the most beautiful things anyone has ever done for me (another being Calvin’s birthmother choosing us to be his parents), and I will never forget the amazement I felt when I walked into that room. Even Colin shed a few tears, on the outside. 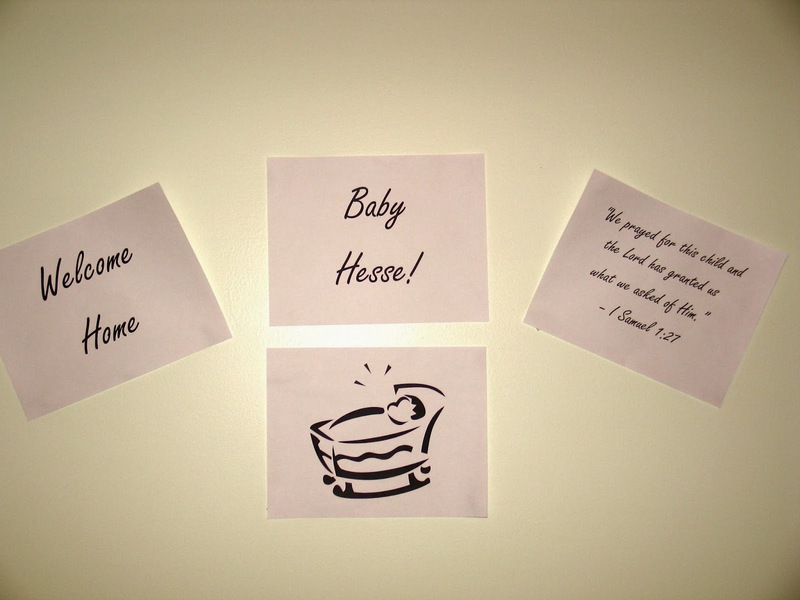 Our friends put up signs around the nursery for Calvin’s homecoming. Best use of clip art ever. “Weeping may last for the night, but a shout of joy comes in the morning.” (Psalm 30:5b) Stay up with your friend now, during this long night of waiting, and you’ll get to rejoice with her that day she finally gets to hold her child in her arms. In the meantime, you’ll watch together how the Creator redeems broken expectation and transforms it into delayed – yet very much worthwhile – gratification.